A summary of the items offered from this sale are listed below. Antique American Furniture- 2 small New England Queen Anne Highboys; NJ tip and turn ball and claw foot tea table with carved knees and arched door pane 2 painted corner cupboards; cherry PA blind door Chippendale secretary; NY Hepplewhite Pembroke table with bell flower inlay on the legs; R Perkins, Jaffrey, NH tall clock; Chippendale and Sheraton 4 drawer chests; shaped top Queen Anne candle stand; one drawer stands; paint decorated dressing table and wash stand; tiger maple Sheraton field bed; 2 mahogany Empire drop leaf dining tables plus more. Antique English Furniture - 1st period Walnut Queen Anne wing chair with cabriole front legs, serpentine stretchers and cone arms; walnut Queen Anne mirror; chinoiserie decorated Chippendale side chairs; William and Mary ball foot 4 drawer chest; Late Sheraton 2 part banquet table with reeded legs; 19th century inlaid tall case clock by Cyrus Crew Tetsburg; Edwardian cluster leg pierced tray silver table. Custom Furniture-Pair of ladder back armchairs; William and Mary tavern table, camelback sofa, carved Chippendale wing chair; pair of Queen Anne side chairs with needlework seats; Set of 10 pierced splat Chippendale dining chairs with 2 arms. American Fine Art-Important Thomas Moran watercolor of the Italian coast line; Charles Wilson Knapp oil on canvas landscape; large William Blair (Bruce) oil on canvas Mt Ascutney, VT; others by Eloisa Schwabb, E Bauer, I Moskowitz; Primitive portrait of Young man; Frederick Rhodes Sisson, plus lots more. Sporting Fine Art- Important Edmund H Osthaus water color of 3 hunting spaniels; Harry Stone Reeves oil on canvas horse portrait and a grouping of Robert and Virginia Warfield carved & painted birds some in large group sizes; 2 George Connell watercolors; sporting prints and etchings. 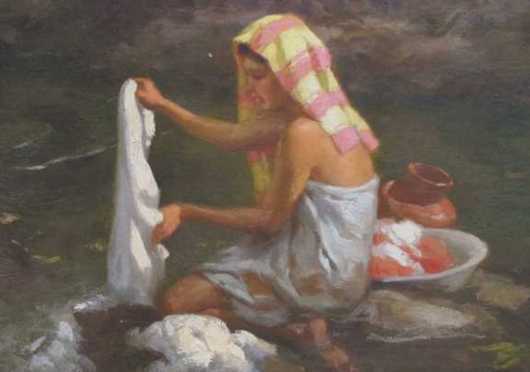 English, Continental, Philippines & other Fine Art-Philippines: Important Fernando Amorsolo oil on panel of a woman hand washing clothes; UK-William Huggins oil on canvas landscape; also art by George W. Rice; Frederick Calvert oil on panel Dutch landscape; James McBey water color seascape; Sidney R Percy oil on canvas farm scene; Continental: French, Jean Jacques Morvan; 2 oil on canvas interior scenes 1 signed illegibly, numerous prints and etchings 1 by Albrecht Durer and another by Ferdinand Shmutzer. Accessories-Important Fitchburg, Mass Pratt family register and fire bucket: Clocks: French figural marble and Chelsea mantle clocks; Pottery and Porcelain: Mocha pitcher, Staffordshire vases, Historical blue, decorated lustre & other historical pitchers; 4 silhouettes; appliqué quilt; 4 Miniature paintings on ivory with provenance; large Bein Ed Audubon; Marine: whale bone swift, 2 ships models and 7 volume set Jackson’s History of American Merchant Marine; Pre-Columbian: 2 ceremonial decorated clay flutes and Machalilla carved owl; Native American: Penobscot decorated war club; lot of early pewter; set 4 Vaseline glass Sandwich candlesticks; cast iron urn with base; set of 4 FJ Huntington terrestrial maps and a horse weather vane. Coin, Sheffield & Sterling Silver: Coin: Important English shell decorated flatware service with provenance plus other early continental flatware and American basket of flowers decorated spoon and ladle collection; NY creamer by Ball/Black and ladle by Albert Coles; Sheffield: large candelabrum by M Boulton plus other candle sticks, wine coasters and serving pieces; Sterling: Important Arthur Stone tea/coffee service plus other Stone items; Tiffany & other round trays; large vase; Gorham & Durgin tea sets; 3 large flatware services fiddle head and Deco designs; plus lots more for a great selection. Antique Oriental Rugs- Room size: bold center med 10 by 13 Heriz plus a center med, 1930s Sarouk; worn geometric Sumac; scatter size: Sarouk, 3 early Caucasians, Tekke Bokhara, modern silk Tabriz style.